Throws & locks in Karate are the scoop of the year, rightly. While discussing the topic, the perspective is usually that of the executor of a technique (tori 取り): he applies locks and throws. But what did the initial attacker and final receiver of the technique (uke 受け) do? More specifically, what do the early sources say he does? In each of the six cases of throws described by Funakoshi in 1925, the opponent attacks by plunging forward. This is done either with one hand, or with both hands. There is no attack were uke uses locks & throws to attack tori. 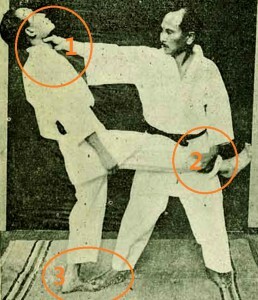 In order to illustrate the above, I chose two techniques from among the so-called “9 Throws of Funakoshi.”(*1) To do so, I used the text from the 1925 edition, while for the photos I used the 1935 edition as they more clearly illustrate the sequence of the techniques. By the way, a similar technique was shown by Dutch Nicolaes Petter 1674. Therefore it seems that karate locks & throws – at least from the cited source and at that time – were solely designed against strikes. If Karate is ought to fulfill its role as a grappling art, it needs to include throws & locks as methods of attacks, just like Jūdō and Jūjutsu-like systems always did. When talking about locks and throws they [karate people in Tokyo] assume that these only exist in jūjutsu and jūdō. This way of thinking is exceedingly counterproductive with respect to karate itself and can only possibly be attributed to a lack of knowledge. From a research perspective there is another interesting thing to note that had been ommitted in the 1935 Funakoshi edition, and therefore also in the English translation of it: the techniques presented in the 1925 edition here were explicitly described as applications of specific Kata. Nodo-osae, making “Funakoshi’s throws” ten in total, not nine. *2: In the 1935 edition this technique was renamed to “spinning-top throw” (koma-nage 獨樂投). *3: In the 1935 edition this technique was renamed to “arm ring” (udewa 腕環). This entry was posted in Misc and tagged Funakoshi's 9 Throws, Karate, Throws and Locks. Bookmark the permalink.